Sorbetti is a boss that appears in the game Super Mario Galaxy 2 in the Freezy Flake Galaxy. It appears in the mission Sorbetti's Chilly Reception. Sorbetti's name is a portmanteau of the words "sorbet" and "yeti". Sorbetti is a gigantic, living spiked snowball, with two crystals for eyes and an evil grin. It also has a bulbous red nose that serves as its weak point. Sorbetti bears a resemblance to Tap-Taps from the Yoshi's Island series, especially Tap-Tap the Red Nose. It combined with the planet it's fought on resembles a snowman, particularly in its artwork. Before Mario fights Sorbetti, he takes a Launch Star from the previous planet and lands on a small planetoid, which is actually Sorbetti itself, though its eyes, nose, and mouth are missing (though one of the lumps appears to be its nose covered with snow). Once Mario uses the Sling Star to reach the slightly larger spherical planetoid below, the above planetoid will reveal itself as a monster, fall down onto the lower planetoid and start rolling around it to attack Mario. As this is Sorbetti's only form of attack, Mario must damage its sole weak spot by spinning its nose as it rolls around the planetoid, much in the same way he would break a boulder. Snow pillars positioned at various intervals around the planetoid serve as obstacles and hinder Mario's movement. If Sorbetti runs into a pillar of snow, the pillar will be destroyed, and Sorbetti will bounce away from it slightly before continuing its attack (the same will happen if it runs into one of the trees on the planetoid). This may be better or worse for the player, depending on how Mario's location changes during the battle. Mario can also destroy a pillar with a spin, which will occasionally reveal a coin. These pillars cannot be fully cleared from the planetoid, since a new one will pop up after a few are destroyed. If Sorbetti hits Mario, it will laugh and start rolling in the opposite direction. When Mario hits Sorbetti, it will be knocked backward, pause briefly, and then continue its attack. After Sorbetti is hit twice, it will become infuriated and roll around the planetoid faster and more erratically. When Mario finally hits Sorbetti a third time, the boss is knocked backward and explodes, rewarding Mario with the mission's Power Star. 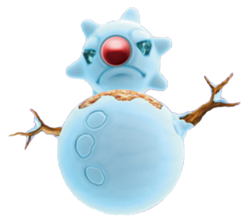 Sunōkī From the English word "snow"
Sorbetti shares its boss theme music with Peewee Piranha, Rollodillo, and Prince Pikante. Sorbetti's battle is similar to Bowser's battle on the first planet of Bowser's Galaxy Reactor in Super Mario Galaxy. This page was last edited on February 14, 2019, at 05:00.